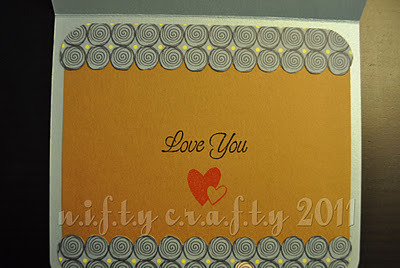 n.i.f.t.y c.r.a.f.t.y: Anniversary - Love you! Hello everyone...it's good to be back to Nifty Crafty after quite a long rest. A lot of cards to make!...keeping my spirit high... step by step will get them done! 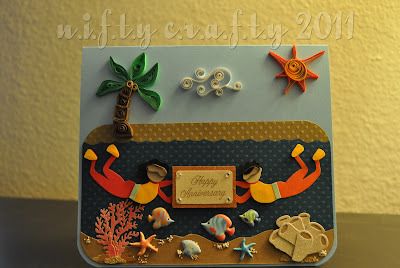 Here I made another beach and diving themed card for a lovely couple for their wedding anniversary. 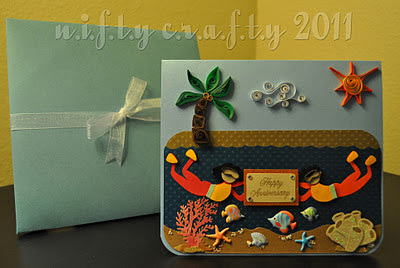 A simple modification of the previous beach themed anniversary card which was made for a friend of mine. It was quite challenging for me to modify the card in the first place. But with a proper sketch and many try outs...I finally finished off this card happily. 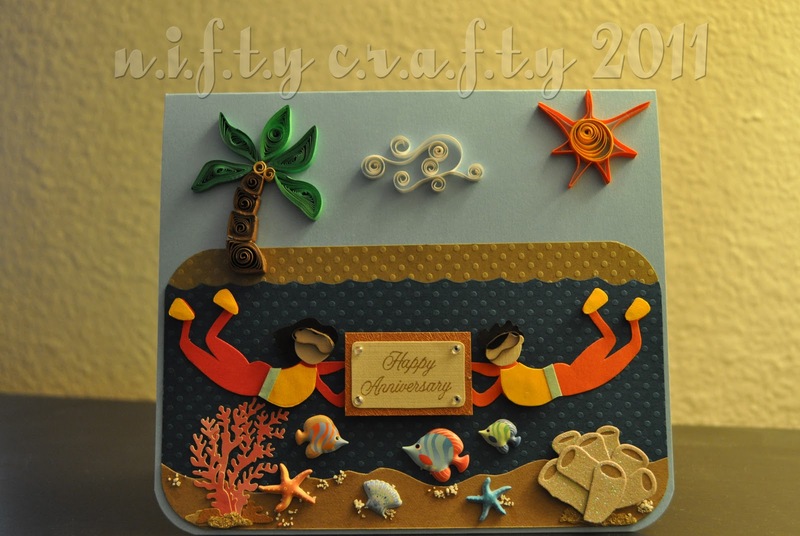 The front of the card shows the "Happy Anniversary" greeting being held by the divers. This horizontally folded card perfectly fits two divers along with the coconut tree, cloud and striking sun which were made using quilling technique. It was pretty interesting to sketch and cut out the bits and parts of the diver images. The inside card was something I loved the most! A "Love you" sentiment which was stamped and embossed led me to emboss the hearts shaped stamp...which happened to go well with the sentiment. How nice to have the embossed and glossy effect on the card! I really like how it turned out...I hope the couple will like my work...wish them a wonderful happy wedding anniversary! Thanks for visiting Nifty Crafty and for any comments that you leave. PS - I tired to post on you blog but it kept asking me for my Profile and choices were Google, LiveJournal, Wordpress....none of those things are familiar to me; so I am just sending you my comments via email.